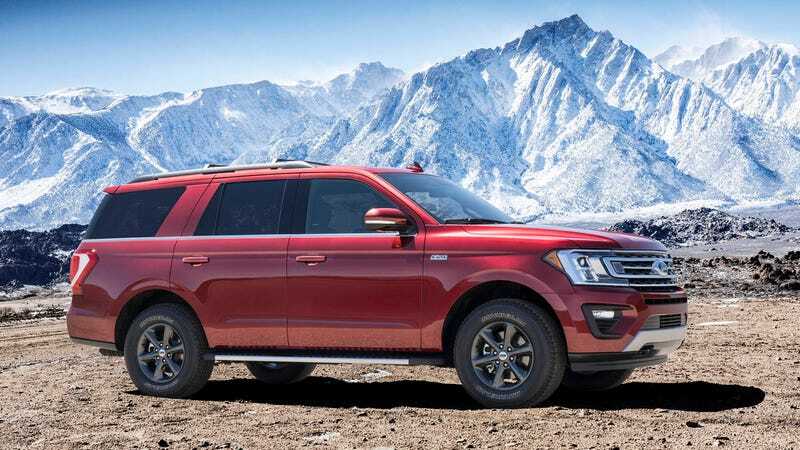 The picture above was included with this Autoweek article about the new 2018 Ford Expedition. I was very surprised to see the presence of honest-to-God trucky looking sidwalls on a production large SUV, instead of the trend towards gigantic wheels and lower profile tires. Looking at this close-up of the actually-has-a-sidewall tire got me to thinking. It’s a Michelin Primacy XC tire, which According to Michelin is a new OE-fitment all-season truck tire, and according to Tire Rack falls in their Highway All-Season category. Then I thought, hmm, what’s that badge on the fender there? That article mistakenly refers to the Primacy XC tires as “all-terrain Michelin Primacy XC tires tuned more for on-road driving than for true off-roading.” That’s an accurate description, except for they’re not all-terrain tires. The Ford configurator also refers to them as all-terrain tires, when they’re clearly not. But hey, whatever. Nobody’s actually going to go rock crawling in an Expedition, and tall sidewalls on trucks are a good thing!